I love making pie, but I hate cutting and serving it. Is it going to gel properly? Is it going to slice up nice and pretty? For this reason, I love making pie bars. They’re easier to make and much, much easier to serve. Take cherry pie, for example. It’s one of the messiest, gooiest, hard-to-serve pies out there. 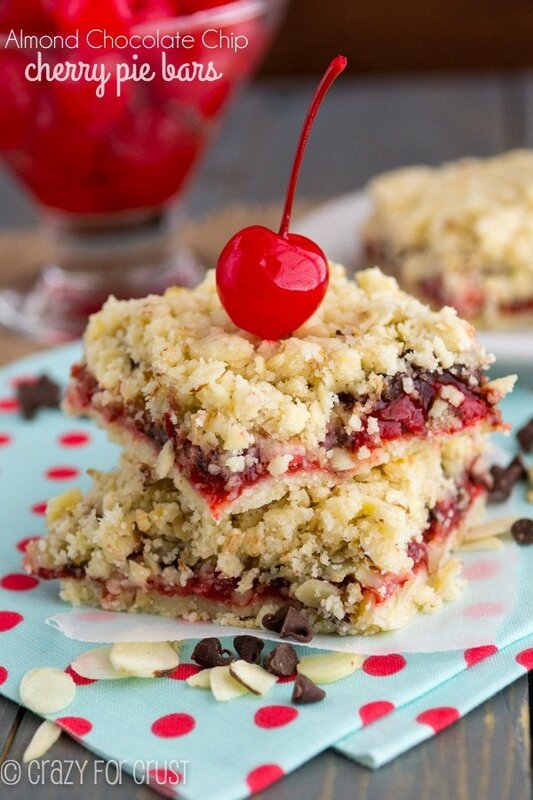 Make cherry pie bars and you take all the stress out of it. Add chocolate and almond and you have perfection! I have a funny story to tell you. Embarrassing funny – for me. Our elementary school had a fundraiser last Friday night. It was an adults-only evening with food and cocktails and music and dancing. A bunch of us girlfriends decided to go together and leave our husbands at home to deal with the kids. Girls night out! Armed with drink tickets and dressed up in heels, we were impatient for the dancing to begin. I mean, we live in the suburbs, have kids, work, and have extracurricular activities. A night of dancing? Unheard of. That wasn’t the embarrassing part, BTW. The embarrassment came when I spotted one of my friends open her eyes wide at me from across the dance floor, followed quickly by her dashing to my side. Turns out an Anthropologie wrap dress is not conducive to dancing. Plastic snaps don’t like hip-hop. Thank goodness for ruffles, to hide my “girls” when the snap popped. Then it happened 3 more times over the course of the evening. That party got real fun, real fast. Anyway. Luckily the room wasn’t full. We’ll just pretend no one saw anything. So, let’s talk about pie bars. They’re my favorite way to eat pie. They’re easier to make than a traditional pie, they’re easier to cut, and they’re easier to serve. Plus the crust/crumb ratio to filling is better in my favor. I want a lot of crust and crumble! 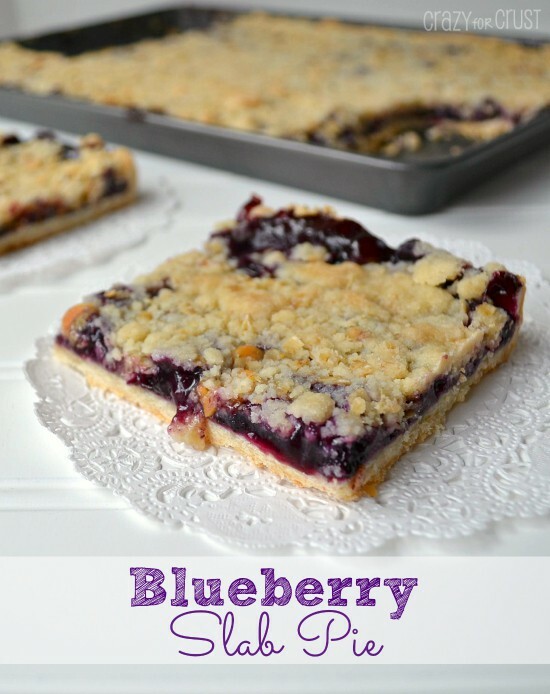 I’ve made bars similar to this before, with blueberry and apple butter. This time, when I was cleaning out my pantry, I found a can of cherry pie filling that needed to get used. Because I’m me, just plain cherry wouldn’t work, so I added chocolate chips and almonds. These are super simple to make. You just have to press the crust into the bottom of a 9×13″ pan. I added almonds to my butter crust and to the crumble. They add a yummy crunch and flavor to the bars. (I’m also IN LOVE with adding almonds to shortbread bars.) Spread the pie filling over the crust, sprinkle with chocolate chips, and top with lots and lots of crumble. I like to bake these in a pan that’s been lined with foil and cooking spray, so I can lift the whole batch out of the pan for easy slicing. That’s totally optional, and I only do it because (1) I want pretty cuts for pictures and (2) I don’t like washing my pans. Foil = simple rinse of pan. Works for me! Serve these pie bars alone, or with some ice cream or whipped cream. They’re the perfect dessert for a summer party. Play music at the party, get the guests dancing, and they’ll eat more. Almonds and chocolate chips are the perfect addition to cherry pie bars. And they're easy to serve and perfect with some ice cream on the side. 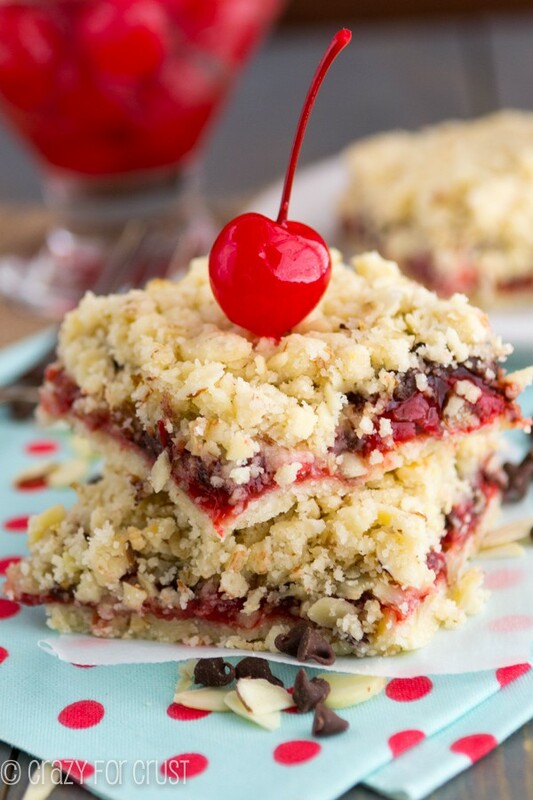 Almond Chocolate Cherry Crumble Bars - these EASY pie bars are crumbly and full of almonds, maraschino cherries and CHOCOLATE! Make the crust: add butter, flour, salt, and sugar to a large bowl. Mix with a hand mixer until it becomes crumbly. (You may need to use your fingers to break up any larger chunks of butter.) Press into the bottom of the prepared pan. Bake for 15 minutes. While the crust is baking, mix the crumble. Place all the crumble ingredients in the same bowl you used for the crust and mix with your mixer until crumbly. Again, you may need to use your hands to work in the larger chunks of butter. After 15 minutes, remove crust from the oven. 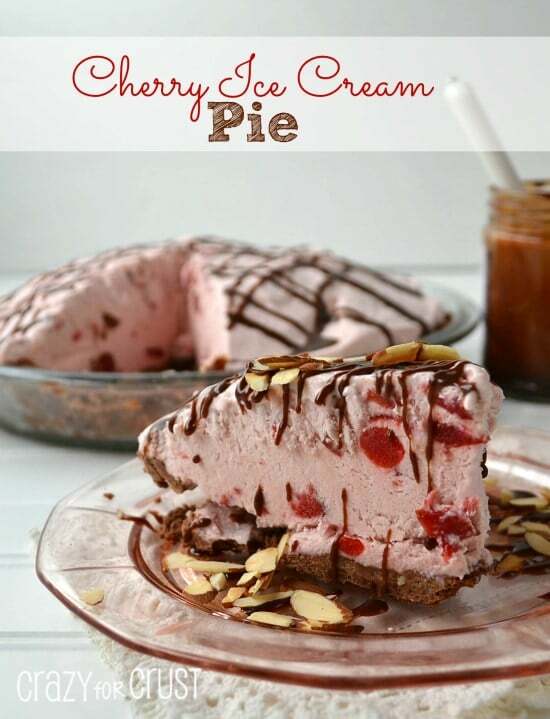 Spread the cherry pie filling over the crust in an even layer. Sprinkle with mini chocolate chips. Sprinkle the crumble evenly over the filling and press gently to compact. Bake for an additional 20-25 minutes, until topping starts to turn golden. Cool completely before removing from pan. Cut into squares. Serve alone, or with whipped cream or ice cream. Store in an airtight container in the refrigerator for up to 3 days. 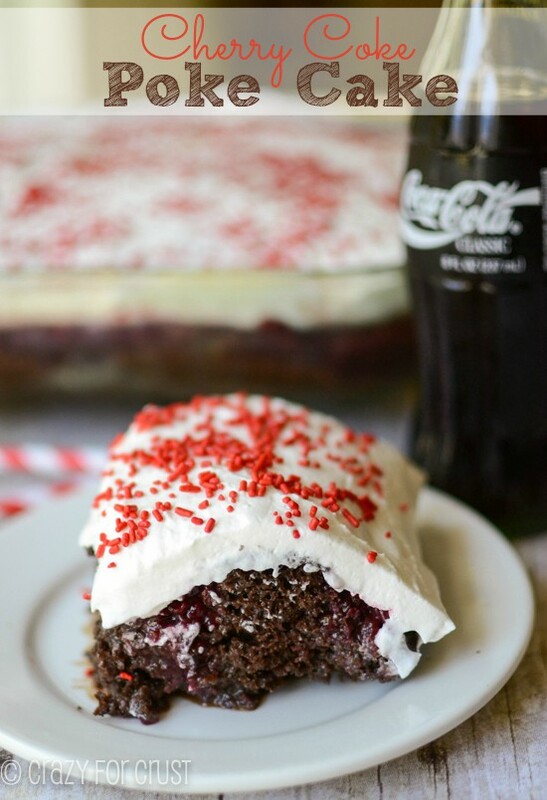 If this recipe caught your eye, be sure to check out Drunken Cherries, Cherry Almond Braid, Apple Pie Bars, and Cherry Oatmeal Crumble Bars. Okay, ONE, your photos are amazing! TWO, I totally need a handful of these. Or plateful. Whichever is bigger. I’m obsessed with cherries lately. These bars look perfect!